Belgium suffered defeat in their first game since the Brussels attacks as Cristiano Ronaldo ended a run of four internationals without a goal. Portugal took control when Nani finished confidently midway through the half after getting behind the defence. Ronaldo's glancing header doubled the lead in Leiria, which staged the game after it was moved from Belgium amid security fears. Romelu Lukaku headed home a cross from brother Jordan but Portugal held on. The visitors wore T-shirts during the warm-up that carried the message "in memory of all victims". Portugal - who are grouped with Iceland, Hungary and Austria at Euro 2016 - were inspired by the elusive Ronaldo, who teased Belgium with his trickery and pace. Both countries will now play three more friendlies before Euro 2016. Belgium, who were unbeaten in five matches before kick-off, face Switzerland, Norway and Finland in the space of eight days, while Portugal meet Norway, England and Estonia. Match ends, Portugal 2, Belgium 1. Second Half ends, Portugal 2, Belgium 1. Substitution, Portugal. Danny replaces Danilo Pereira. Substitution, Belgium. Dedryck Boyata replaces Jason Denayer. Mousa Dembélé (Belgium) is shown the yellow card. Danilo Pereira (Portugal) is shown the yellow card. Attempt missed. Ricardo Quaresma (Portugal) right footed shot from the centre of the box misses to the left. Assisted by Cédric Soares. Corner, Belgium. Conceded by Pepe. Attempt missed. Radja Nainggolan (Belgium) right footed shot from outside the box is close, but misses to the right. Assisted by Axel Witsel. Substitution, Belgium. Mousa Dembélé replaces Marouane Fellaini. Attempt missed. Raphael Guerreiro (Portugal) left footed shot from outside the box misses to the left. Assisted by Danilo Pereira. Hand ball by Marouane Fellaini (Belgium). Attempt saved. Ricardo Quaresma (Portugal) right footed shot from outside the box is saved in the centre of the goal. Assisted by Renato Sanches. Substitution, Portugal. William Carvalho replaces André Gomes. Attempt missed. Raphael Guerreiro (Portugal) left footed shot from outside the box is just a bit too high from a direct free kick. Attempt missed. Axel Witsel (Belgium) right footed shot from outside the box is close, but misses to the left. Substitution, Belgium. Michy Batshuayi replaces Dries Mertens. Goal! Portugal 2, Belgium 1. Romelu Lukaku (Belgium) header from very close range to the bottom right corner. Assisted by Jordan Lukaku with a cross. Dries Mertens (Belgium) wins a free kick on the left wing. Substitution, Portugal. 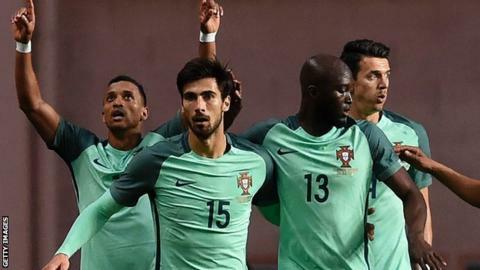 Eder replaces Nani. Substitution, Portugal. Ricardo Quaresma replaces Cristiano Ronaldo. Substitution, Belgium. Jordan Lukaku replaces Guillaume Gillet. Offside, Portugal. Nani tries a through ball, but Cristiano Ronaldo is caught offside. Offside, Belgium. Dries Mertens tries a through ball, but Radja Nainggolan is caught offside. Attempt saved. Radja Nainggolan (Belgium) right footed shot from outside the box is saved in the bottom right corner. Assisted by Dries Mertens. Nacer Chadli (Belgium) wins a free kick in the attacking half. Attempt missed. Dries Mertens (Belgium) header from the centre of the box is close, but misses to the left. Assisted by Radja Nainggolan with a cross. Attempt missed. Cristiano Ronaldo (Portugal) right footed shot from the centre of the box is close, but misses to the right. Second Half begins Portugal 2, Belgium 0.